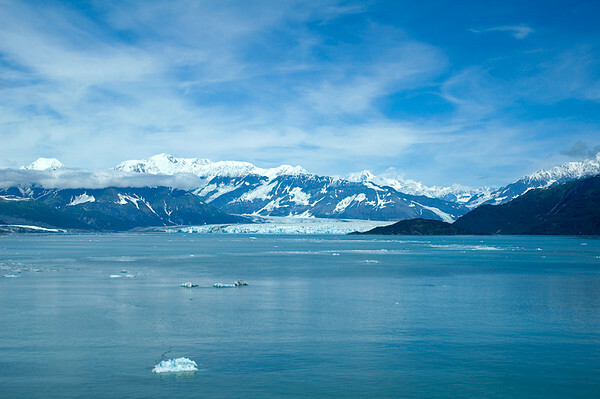 Hubbard Glacier is a tidewater glacier in the U.S. state of Alaska and the Yukon Territory of Canada. From its source in the Yukon, the glacier stretches 122 km (76 mi) to the sea at Yakutat Bay and Disenchantment Bay. It is the longest tidewater glacier in Alaska, with an open calving face over ten kilometers (6 mi) wide. The ice at the foot of Hubbard Glacier is about 400 years old: it takes that long for ice to traverse the length of the glacier. The glacier routinely calves off icebergs the size of a ten-story building. Where the glacier meets the shore, most of the ice is below the waterline, and newly calved icebergs can shoot up quite dramatically, so that ships must keep their distance from it as they ply their way up and down the coast.